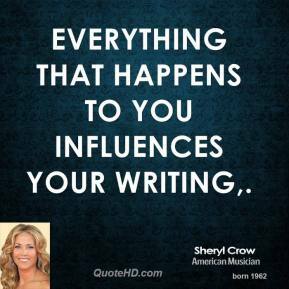 Everything that happens to you influences your writing. I'm not dead. 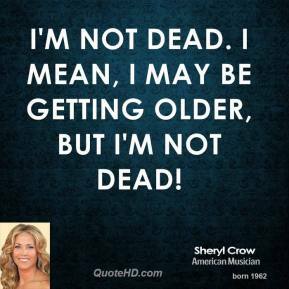 I mean, I may be getting older, but I'm not dead! I look at my hands and go, 'Hmm...what happened? Whose hands are those? Oh my God, they're mine'. 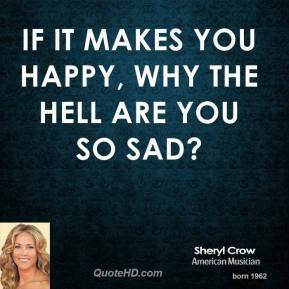 If it makes you happy, why the hell are you so sad? Once over there [Balkans], I felt extremely patriotic. Here are these people, from 18-year-olds to military veterans, enduring real duress for the cause of peace. 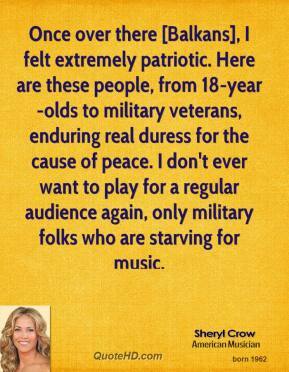 I don't ever want to play for a regular audience again, only military folks who are starving for music. 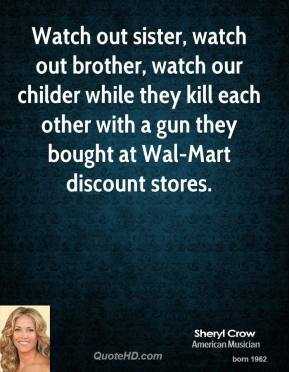 Watch out sister, watch out brother, watch our childer while they kill each other with a gun they bought at Wal-Mart discount stores. 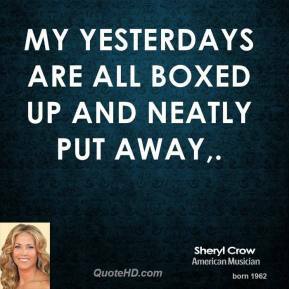 My yesterdays are all boxed up and neatly put away. 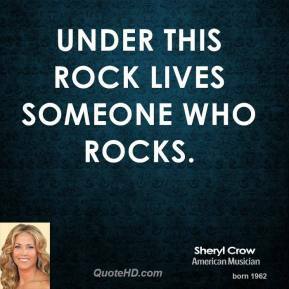 Under this rock lives someone who rocks. It's kind of a reminder, particularly when you look at his young children, how they gravitate to goodness and to light, ... 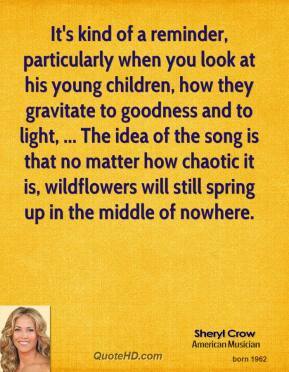 The idea of the song is that no matter how chaotic it is, wildflowers will still spring up in the middle of nowhere. 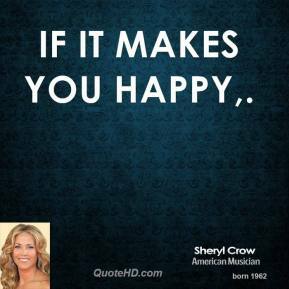 If It Makes You Happy. 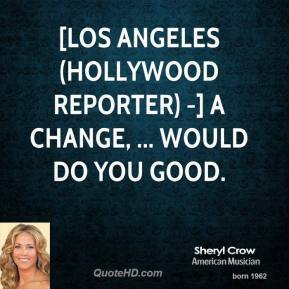 [LOS ANGELES (Hollywood Reporter) -] A change, ... would do you good. 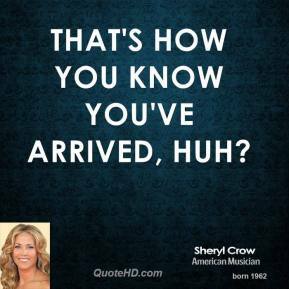 That's how you know you've arrived, huh? 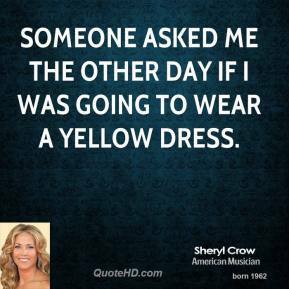 Someone asked me the other day if I was going to wear a yellow dress. 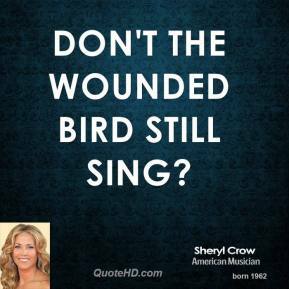 Don't the wounded bird still sing? 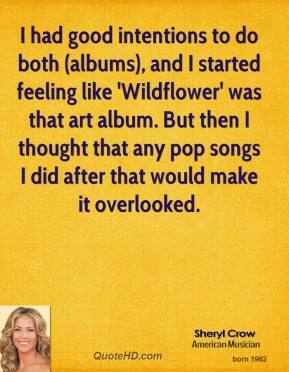 I had good intentions to do both (albums), and I started feeling like 'Wildflower' was that art album. But then I thought that any pop songs I did after that would make it overlooked. Being around children that small, you see how naturally they gravitate to the light. They're not cynical yet. It takes many years to unlearn that kind of innocence. They're sort of the example for me. 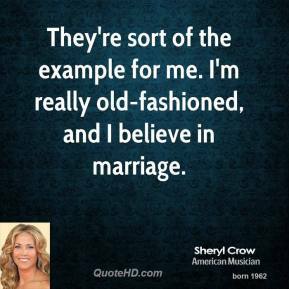 I'm really old-fashioned, and I believe in marriage. 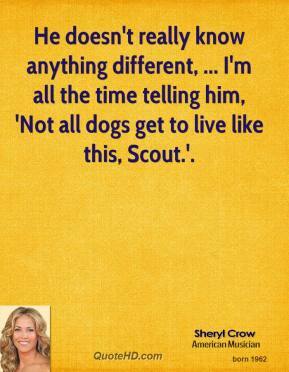 He doesn't really know anything different, ... I'm all the time telling him, 'Not all dogs get to live like this, Scout.'. It was an off year; I was shocked, . I think my relationship to work has really changed the last couple of years. 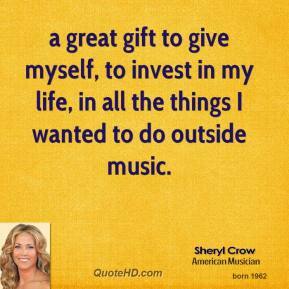 a great gift to give myself, to invest in my life, in all the things I wanted to do outside music. Now that I'm in my 40s, it's much easier to be an artist. It's good knowing that I'm not in the game to be competing with really young groups of kids on the radio. 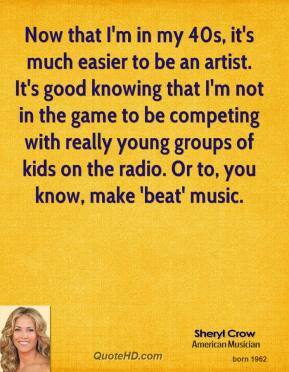 Or to, you know, make 'beat' music. 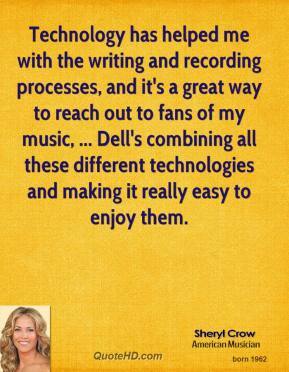 Technology has helped me with the writing and recording processes, and it's a great way to reach out to fans of my music, ... Dell's combining all these different technologies and making it really easy to enjoy them. 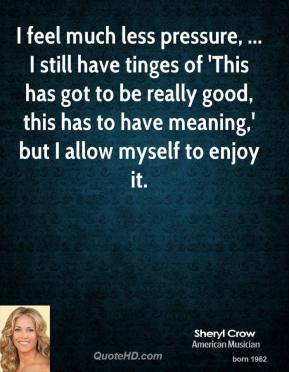 I feel much less pressure, ... I still have tinges of 'This has got to be really good, this has to have meaning,' but I allow myself to enjoy it.